Bauhina variegata candida is native to much of China and India. 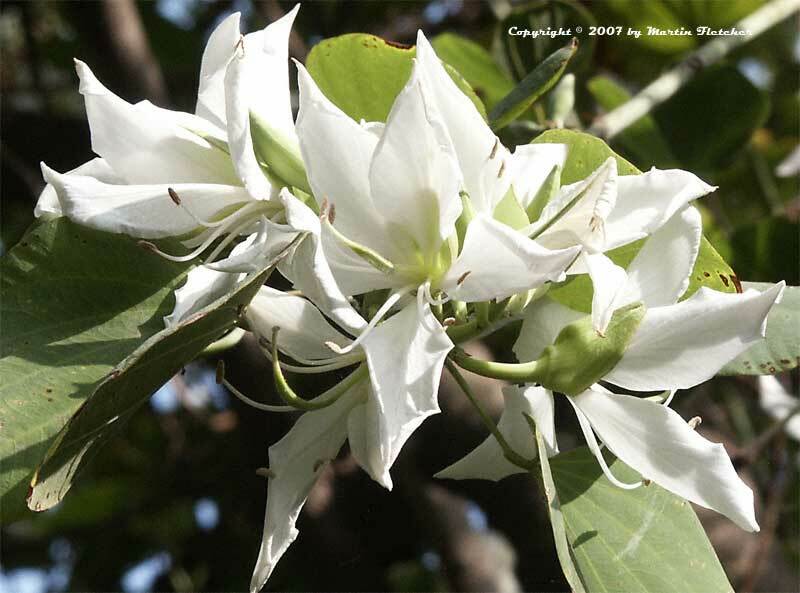 The flowers, leaves and bark are used for food and medicine. Bauhinia variegata candida is a medium sized tree. This Bauhinia blooms repeatedly through late Winter and Spring and will periodically produce a few blossoms during the Summer. The Buddhist Bauhinia will often produce its first bloom before the leaves are produced. The trees are evergreen in frost free locations, though they may look a little threadbare during the chilly Winter months. Like many of the Orchid Trees this one needs regular thinning to keep the tree from breaking itself down. The trees can subsist on our Southern California rainfall but need a little wind protection. Plants are hardy into the high teens. Flowers and foliage of Bauhinia variegata candida the Buddhist Bauhinia or White Orchid Tree. High resolution photos are part of our garden image collection.